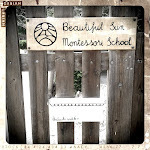 Beautiful Sun Montessori: Beginning again. "Be patient with everyone, but above all, with yourself. I mean, do not be disheartened by your imperfections, but always rise up with fresh courage. I am glad you make a fresh beginning daily. There is no better means of attainment to the spiritual life than by continually beginning again, and never thinking we have done enough. How are we to be patient in dealing with another's faults if we are impatient in dealing with our own? He who is fretted by his own failings will not correct them. All profitable correction comes from a calm and peaceful mind. " Joseph Goldstein "The Experience of Insight"
Stuff that you can download for free. Phonetic books, no illustrations though.